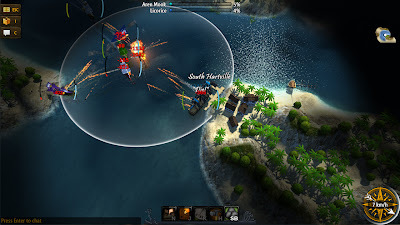 Windward is a fast-paced naval combat game set in the mid-17th century. The game features a variety of different ships to choose from, different maps to play on, randomly generated booty to discover, talents to earn, ships to unlock, and plenty more. Windward is currently in beta and Windows/Mac versions of the game are available on Desura. The game has been made using Unity3D engine, a Linux build can be downloaded from here. I have tested the game in Ubuntu 12.10 and it runs beautifully. The game is graphic intensive but you can customize the quality from game options. The free Linux build is limited to one ship slot, but most of other game features are available. You can get access to additional ship slots and other content by purchasing the game for $10 from Desura. Desura should send you a game key after purchase. In my testing, the game crashed when I clicked on key activation option, so you may want to wait for Linux version to be officially available on Desura.